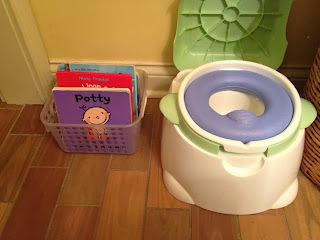 Back when Ayden was about 18 or 19 months old and we introduced him to his little potty, potty books, and undies, we really did not expect him to catch on so quickly. In my experience as a preschool teacher and aunt, most boys graduate to undies somewhere around their 3rd birthday. I always told myself (and David), that was when it would happen. 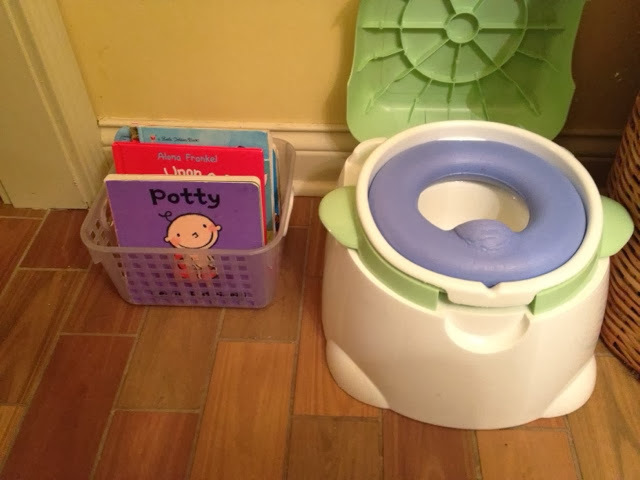 We just got the potty, the books and the undies as a foundation for him so that whenever he was ready, he could take off running with it. No pressure. Of course we are proud of all of Ayden's accomolishments, big or small, and catching on to using the potty is no exception. It is something we have talked about, encouraged and celebrated with him for months now and he has jumped into it with no reservations. On the other hand, as with anything in life, there are pros and cons to every situation. - He fights having to put on diapers for sleeping. He loves his undies and wants to wear them all the time. He wakes up dry sometimes, especially after naps, but not enough to "undie" it at this point. - He "cries wolf" about every 2-5 minutes for an hour leading up to code browns and it. gets. old. (This is slowly getting better as he learns about the sensations. Still can be frustrating, though). - Sometimes after crying wolf for that hour he'll have a moment where he says, "OH, NO MOMMY/DADDY!" and that is when we know he's started going in his undies. This seems to only happen in public and has happened twice now. He went through a small phase where he would skip an entire day of #2 and now he seems to be going to the other extreme. The first time it happened was yesterday at the library. We were supposed to just be running in quickly to get a book David had put on hold but Ayden saw the kid area and wanted to play. We had some extra time so why not? The only problem is that I did not bring his bag in with us. When he said, "OH NO, MOMMY!" I wisked him to the bathroom, hoping we'd make it in time only to find that we had not. There we were in a bathroom that had a hand dryer instead of paper towels and cheap 1-ply toilet paper. No wipes, no wet bag, no change of undies or pants. All of that was in the car. Up until now he had a 100% success rate for peeing in the potty in public and seemed to prefer holding #2s until he was at home or wearing a diaper. Now we know he's transitioning to using the potty when he needs to for #2. This, of course, is a wonderful emerging skill... when I am prepared for it! I did my best to keep my cool (we try to make poop a non-issue) but I came away with a less than stellar performance in that department by the time we left the bathroom. He squirmed and wiggled so much when I was removing his pants and undies that it became a much bigger mess than necessary and I did not have what I needed to clean it up. I summoned the super-mom from within that we all seem to be able to access in crisis mode and did what I had to do. I cleaned him up the best I could with the cheap toilet paper, put his pants back on him without his undies, checked out David's book as fast as I could and did the real clean up work when I got to the car and all of our supplies. The same thing happened when we were out to dinner with friends tonight but this time, I was an old pro. Once I knew what was going on, I went back to the table to grab our diaper bag, took it slowly and it was much less of a crisis. Ayden finished his business on the potty, which was a first, and everything was okay. Humans, parents especially it seems, are adaptable and every time we experience a similar situation it gets easier and less stressful to deal with. Now I am learning that Ayden is becoming ready to go #2 on the potty when he needs to no matter where we are. This is something to be celebrated and I just need to make sure I am prepared for the worst, even if we are just quickly running in some place. Being prepared makes a world of difference in the toll an experience takes on you. We want to continue making him feel comfortable with this potty business so I owe it to him to set us both up for low stress and success. This all easily fits into a small shoulder bag along with my keys, phone and wallet though I still use my cute diaper bag a lot of the time. If I have all of this on me I can conquer any bathroom emergency with confidence and success all while keeping my cool and therefore Ayden's. Without them, things are a mess... literally and figuratively speaking. What are the essentials for your potty training toddler's bag? Flashback! Here's what we were up to on year ago today: "A Day of Focus"
The extra undies and pants is huge - I need to put another set in the car (good reminder!) We are a year into it and its been so long since we have had an accident, but at not quite 3 years old, I know she can still have an accident at any time and I'm not the most prepared anymore :) Wonderful job with Ayden! What a huge accomplishment! Glad I could remind you :). There is definitely a level of comfort you get before being thrown for a loop!! He might not like this type of information out there on the Internet when he is older. If more people would talk openly about things that are so normal (I'm positive every human has had/will have an accident or two while potty training) maybe we wouldn't all be so ashamed of our bodies and bodily functions. There is a book out there called Everybody Poops that might be a good read for you ;). Seriously though, if he is someday ashamed of the fact that he made a mess while he was potty training at 23 months, I will not hesitate to take it down. Our hope is that we can raise Ayden to embrace his body, and everything that comes with it, without shame or embarrassment. The people who speak up are the people who let others know they are not alone. I also feel the need to add that anonymous tips, pointers and concerns do not sit very well with me. They feel passive aggressive. Next time you have a concern, please sign in so we can have a proper, adult conversation. You are doing an awesome job. I priase you. This is your journal to record your thoughts and record ayden's milestones and developments and for other moms to relate who are going through the same thing. As a mom myself, I appreciate your blog because it gives me ideas and you are an example of the kind of mother I want to be. So to the anonymous person who commented that remark, I disagree. I love that you record everything, and Ayden will appreciate all your documentation someday. Ayden is a baby, and one can expect that from one his age. Thank you so much! Your support really means a lot to me. I am glad that most of my readers see the true reasons why I keep this blog and I am so happy that it helps you in some way!